Funko's next wave of Game of Thrones figures is coming next month! Hooray! Funko's next wave of Game of Thrones excellent 'Legacy Collection' figures is coming very soon - next month, in fact. And it's a doozy of a wave. Dany, Arya, Brienne, and more, oh my! I'm not gonna lie, I can't wait to have some of these figures on my desk. And sure, this is a collector's focused line instead of a general Toy line, but it's super refreshing to see a wave of action figures that's 50/50 male and female, too. GoT has plenty of ladies that deserve to get in on the figure fun as well! Now where's my Cersei with wine goblet accessory, Funko... that better be in Wave 3. 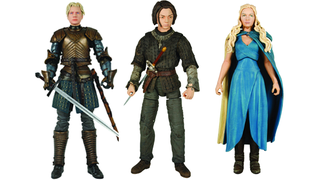 Game of Thrones: Legacy Collection Wave 2 will be out next month, with each figure retailing for around $20.